Recombinant fragment corresponding to a region within amino acids 879-1164 of the Human NUP155 protein (Uniprot ID O75694). WB: NT2D1, IMR32, U87MG and MCF7 whole cell lysates. Our Abpromise guarantee covers the use of ab155904 in the following tested applications. WB 1/500 - 1/3000. Predicted molecular weight: 155 kDa. Essential component of nuclear pore complex. Nucleoporins may be involved both in binding and translocating proteins during nucleocytoplasmic transport. Expressed in all tissues tested, including heart, brain, placenta, lung, liver, skeletal muscle, kidney and pancreas. 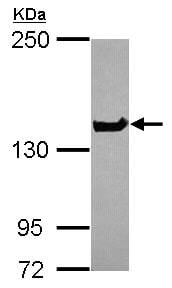 Belongs to the non-repetitive/WGA-negative nucleoporin family. Phosphorylated. Phosphorylation and dephosphorylation may be important for the function of NUP155 and may play a role in the reversible disassembly of the nuclear pore complex during mitosis. Nucleus > nuclear pore complex. Nucleus membrane. Nucleus membrane. In mitosis, assumes a diffuse cytoplasmic distribution probably as a monomer, before reversing back into a punctate nuclear surface localization at the end of mitosis. ab155904 has not yet been referenced specifically in any publications. Publishing research using ab155904? Please let us know so that we can cite the reference in this datasheet. There are currently no Customer reviews or Questions for ab155904.